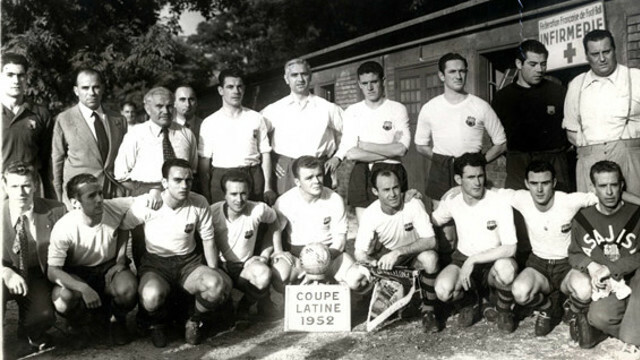 Barça beat Nice in the final of the Copa Latina in the 1951/52 season and lost in the 1973/74 Fairs Cup. FC Barcelona and OGC Niça will play a pre-season friendly on August 2 – the third time the two sides have met. OGC Niça was founded in 1904 and has won four league trophies and three French Cups. The first time the two sides met was in the final of the 1951/52 Copa Latina, at the start of the famous Season of the Five Cups. Barça, led by Kubala, Ramallets and César, who scored the only goal of the game. Coach Ferdinand Daucik put out the following team:Ramallets, Martin, Biosca, Seguer, Bosch, Escudero, Basora, César, Kubala, Aldecoa and Manchón. Barça had beaten Juventus 4-2 in the semi final, which was also played in Paris, with goals from Basora (2), Kubala and Manchón and the Copa was to be the start of a thrilling campaign that saw them take the Spanish League and Cup, the Copa Eva Duarte and the Martini & Rossi Trophy. The team next met in the first round of the1973/4 Fairs Cup. Johan Cruyff had just joined form Ajax, but was awaiting a work permit when the game was played and Barça went down 3-0 in Nice’s old Stade du Ray. Rinus Michels then went on to take the side to their first league title in 14 years. Next Next post: Messi and Mascherano, the last two Barça players to debut in Brazil, ready to go for Argentina.